Make ribboned cushions for an alternative look. Ribboned Cushions can be made in many different ways. Some simple and some elaborate but both equally striking and attractive. Make the complete cushion from attractive ribbons , add a section of weaving, make it 3D Tumbling blocks weave or just decorate a cover. Ribbons can be bought in many patterns, colours, widths and textures. These are really good to use decorate a cushion cover in an appliqué way. The edges are already finished and can be attached by either machine or by hand. They can be added before the cushion cover has been made. One advantage of this is that the ends can be hidden in the seam. This would probably be the best way if the ribbon were to be machine sewn. 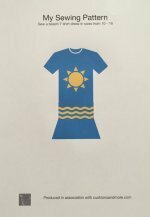 If sewing these on when the cover is made then care would need to be taken to make sure the front and back pieces were not accidentally sewn together. Decide on the number of colours of ribbon and the pattern to be placed onto the cushion cover. These can be just placing a few in corners or diagonals as in the picture above or you can use two, three or four different colours. These could then be inter linked and overlapped to suit your design. Let your imagination go and see what results you get. Once you have decided on your pattern you will need to stop the ribbons from slipping while they are being sewn. This can be done with pins, fabric glue or hemming tape. Carefully machine or hand sew the ribbon to the front or/and back of the cover. 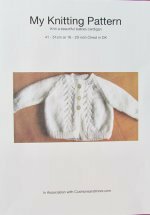 If the fabric you have chosen for your cover has a slightly open weave to it, ribbons can be inter woven between the threads with a blunt needle. 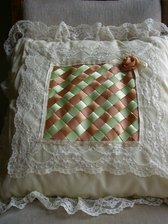 Little rosettes can be made from ribbon and placed on a cushion cover. 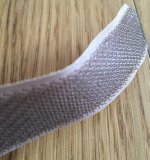 A simple way to do this is to get a length of ribbon and sew a running stitch along a straight edge securing the thread with a know. Pull the thread up until the ribbon makes a rosette and secure it in place. 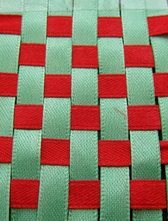 In weaving ribboned cushions you could make a complete cover or just a little section in the middle like the picture above. This is the same technique as you would use when making cloth from thread but in this case the threads are replaced with ribbons. The simple way is to choose two different colours. Decide on the size of your cushion or section. Place strips of one colour on a flat surface. Take the second colour and then weave this over and under the first colour. This will be the first and every odd numbered alternate row. To make the second and every even numbered alternate row, take the second colour and begin under then over the first colour so that the opposite pattern is made from the first row. When you have finished weaving your cover, place fusible interfacing on top and fix with an iron. Make the cushion with the fastening in the middle of the back piece. If the weaving was to be a small section of the cushion then you would need to have borders all around to make it to the size you want. Turn right sides out and insert the pad. These are just a few of the ideas in making ribboned cushions. 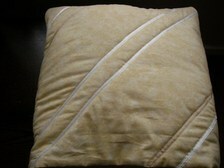 Why not have a go and post your designs on my cushion gallery so we can see how different the weaves can be.